“It’s the coolest sound—it’s what excites me the most. All the hammers out there in the parking lot pounding nails together; there’s nothing like it. It bounces off the building, reverberates everywhere. The whole community knows what’s going on.” Raymond Bodley has more enthusiasm than you might expect on a rainy afternoon, especially when things aren’t going precisely according to plan. The lumber delivery is late and a crew of 15 volunteers waits to get started. The spring rain has delayed everything today, including this delivery, so he has a few minutes to talk to me. It’s Friday May 10 just after 2:00 p.m. and I’m at Christ’s Church at Mason (Ohio) to see the lumber-cutting session, preparation day for CCM’s “Build the Walls” event, when more than 600 volunteers will assemble frame sections for six houses to be given to Habitat for Humanity of Greater Cincinnati. When the lumber finally arrives, Raymond halts our conversation to direct the unloading and I listen to the sound of the parking lot now—a vague patter and hiss of heavy spring rain. For several years now, CCM has hosted this event, directed by CrossRoads Missions of Louisville, Kentucky. Last year the wall frames built here went to Lynette, Alabama and Shreveport, Louisiana. This year all six of the houses built will become homes for Ohio families; five will stay here in town—the first houses that Cincinnati’s Habitat for Humanity will receive from CrossRoads Missions. As the wood is unloaded, 15 men in ball caps and rain jackets find ways to keep seven miter saws out of the rain, and out of one another’s way. The rain makes this cut session last longer than usual—it’s 8:00 p.m. by the time all lumber has been cut, coded, and stacked in readiness for the next day. For those unfamiliar with carpentry, volunteering to build a house may sound intimidating. But CrossRoads’ system is simple, organized, and workable. From novices to seasoned carpenters, volunteers come with a variety of skill and age levels. Each team of 5-to-10 people includes a leader with some construction experience. Drawings of wall sections with coded lumber lists are distributed among team leaders. The team selects and carries the correct lumber from the stacks to its parking lot worksite, and together the team nails together a section. As they build, volunteers write blessings, Scriptures, and prayers on the lumber—another way to offer their efforts to God and bless those who will live within the walls. The team carries its finished section to an inspection station, a CrossRoads staff member checks it for accuracy, and the wall is loaded onto one of the trucks. Each team will build several sections over the course of the morning until all the lumber is used up and the work is done. By 9:30 the hammering reaches full throttle and the church parking lot sounds like a rifle range or a fireworks convention. It really is good music. As sections are inspected and loaded onto the trucks, high-fives are exchanged, backs are slapped, cheers are raised. I spot a lone man lingering at the truck, staring inside, and I realize he’s praying over the walls that will become homes and for the families who’ll live in them. An event of this size requires much behind-the-scenes work. At 5:30 a.m. the breakfast team began to assemble breakfast for 600. At 7:30 they relinquished the kitchen to the refreshment team—40 volunteers who baked and delivered cookies to the parking lot, giving workers energy to burn. The team baked approximately 1,000 chocolate chip cookies, brewed 12 gallons of hot chocolate, and 15 gallons of coffee. The check-in team designated team leaders, organized into work teams, and gave volunteers their team assignments. The Saturday sky is cloudy, but rain is light and intermittent and nobody appears to mind it much. Around 10 a.m. a young boy runs up to me and shouts, “I’m building the walls for my birthday!” I watch teams of couples, families with young children, and senior men who look like they were born wearing tool belts. Kids carry lumber, teams pose for photos with their completed walls, everyone pitches in and gets it done. I spot a three-generation family working together. And I lose count of the number of kids who move from discouragement to triumph after learning the physics of hammer vs. nail. For several years Habitat for Humanity was based in several locations around Cincinnati, each doing the same thing. Now a regional group, Greater Cincinnati’s Habitat has combined resources and accomplishes far more. While only a few houses a year had been built previously, this weekend alone trucks will be loaded with framing for six houses. The frames will be held in a warehouse until time for onsite construction. Dave Lockwood tells me that in a normal year, this event at Mason is CrossRoads Missions’ largest build. 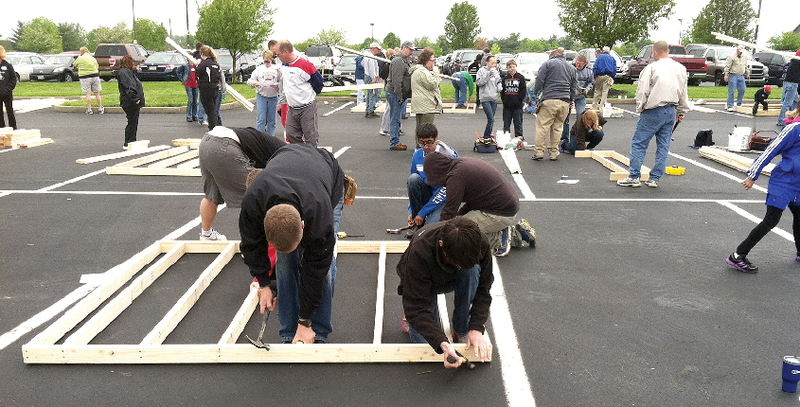 Immediately after Hurricane Katrina, at Southeast Christian Church in Louisville, Kentucky, 33 houses were built in one day by 6,000 volunteers. A rarity, but wow—what a rarity! CrossRoads Missions averages more than 40 builds per year. Two Cincinnati families who will live in these houses work alongside the volunteers today. Those who want to continue work on these particular houses at their build sites may sign up for work days at the check-in tables. Each team is equipped with a bucket of tools, nails used for treated and untreated lumber, and felt pens so volunteers can graffiti their work with Bible verses, words of encouragement, and prayers. It’s best not to stand in one place too long, I discover, as stacks of lumber, trays of cookies, and completed wall sections continually move through the parking lot. Walking down the aisle, teams working all around, every face I meet produces a smile. This is a great way to spend a Saturday morning, building something lasting, doing a good work for someone you may never meet. And you’ll hear—and make—some great music. Mike helm is a freelance writer in Cincinnati, Ohio. He is also the designer for The Lookout.